Clostridium difficile, a major cause of healthcare-associated infections (HAI), is classified as an “urgent threat” in the CDC’s latest report on Antibiotic Resistance Threats¹. Its increasing prevalence and high levels of morbidity and mortality are serious concerns on both human health and economic fronts. C. difficile infection management involves a full-circle range of measures covering prevention, diagnosis, therapies, surveillance, outbreak management and epidemiology. With its global solution, bioMérieux is your partner in fighting C. difficile. Once upon a time, Clostridium difficile was considered little more than a clinical nuisance. Today, C. difficile is one of our most challenging healthcare-associated infections (HAI), accounting for more than 60% of all cases of healthcare-associated diarrhea². In most cases, C. difficile is contracted in the healthcare setting and is connected to antibiotic treatment. C. difficile infection incurs costly treatment, patient isolation and longer hospital stays. In addition to the impact on patients themselves, this means high economic burden on hospitals and healthcare systems. C. difficile is at historically high levels worldwide, according to the Centers for Disease Control. Hyper-virulent strains are emerging, and we are seeing severe outbreaks, and morbidity and mortality rising at alarming rates¹. 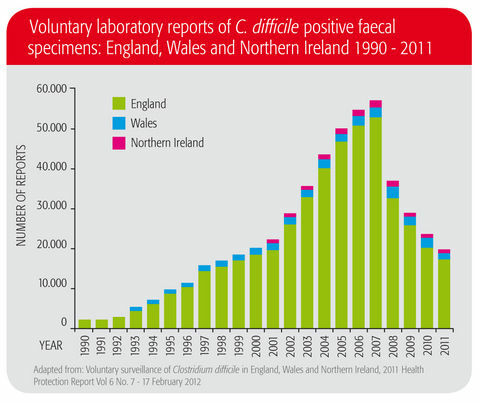 There is also evidence that C. difficile transmission is spreading out of the healthcare setting into the community³. In fact, the CDC classified C. difficile in 2013 as an “urgent threat”, meaning “an immediate public health threat that requires urgent and aggressive action”1. Fighting today’s complex healthcare challenges like C. difficile requires a multi-faceted approach. Healthcare institutions, medical professionals, microbiologists, patients – we are all involved. At bioMérieux, we are your dedicated partners, bringing our longstanding, recognized expertise in microbiology, and our innovative laboratory solutions to support your actions. In the UK, C. difficile infection rates have been decreasing since 2007.
bioMérieux has been on the frontlines of the fight against C. difficile since the beginning. Not only do we listen to your needs, we take a global approach to meeting them, with instruments and reagents needed to support investigation and decision-making for C. difficile infection management. With a high level of integrated automation, our instruments are developed to offer ease-of-use, reliability and traceability. Plus, our range is flexible and accessible – to suit different lab types and sizes, and different management needs. 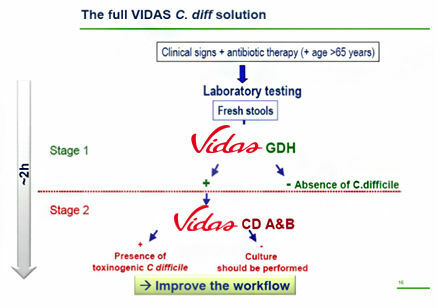 Quik Chek Complete for detection of Clostridium difficile in stools. 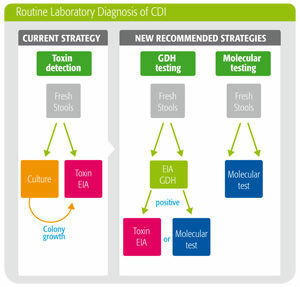 New C. difficile testing algorithm guidelines recommend the use of a two-step protocol starting with a GDH enzyme immunoassay (EIA) followed by a sensitive toxin EIA to confirm positive results, and finally a culture test to establish sensitivity. While this testing protocol provides results similar to the “gold standard” culture + toxin test, it cuts costs and saves time. A guide to utilization of the microbiology laboratory for diagnosis of infectious diseases: 2013 recommendations. Guide to Preventing Clostridium difficile Infections. Updated guidance on the diagnosis and reporting of Clostridium difficile. For culture testing, bioMérieux’s chromID® C. difficile offers clear identification in just 24 hours1,2, up to 30% more sensitive than conventional media² Using a patented chromogenic substrate and mixture of antibiotics, the medium is highly selective. Results are extremely easy to read, with black/dark grey colonies contrasting clearly on a pale agar. The DiversiLab® system provides strain typing results in approximately 4 hours. Using rep-PCR* technology, the automated platform provides standardized, reproducible DNA fingerprinting for C. difficile samples. The system also enables analysis of other bacterial and fungal samples for complete isolate characterization. rep-PCR: amplification of non-coding repetitive sequences interspersed throughout the bacterial genome using Polymerase Chain Reaction (PCR). The rep-PCR technology and rep-PCR primers are covered by U.S. patents (5,691,136 and 5,523,217) and by international patents for Canada and Europe. NOTE: DiversiLab is not for diagnostic use. With more than 50 years’ experience working with microbiology labs, we’ve been at your side throughout the evolution of challenges facing labs around the world – including the emergence of the C. difficile threat. The World Forum on Healthcare Associated Infection and Antimicrobial Resistance, organized by bioMérieux, brings together over 70 international leaders in the field to discuss and drive new strategies to respond to HAI/Resistance challenges. The 4th edition of this unique event was held in June, 2013. Our activities for Antibiotic Awareness Week in November, 2013 included the release of a Practical Guide to Antimicrobial Stewardship in Hospitals. Our Be S.M.A.R.T. with Resistance™ solutions to manage the antimicrobial resistance threat, including information, education and events. We develop educational partnerships with leading associations like the French National Observatory for Epidemiology of Bacterial Resistance to Antimicrobials (ONERBA). We support young microbiologists through grants and awards – knowing that tomorrow’s leaders in the field will help us improve responses to our greatest healthcare challenges.